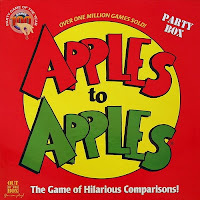 If you're searching for a card game that's simple to learn, wildly replayable, good for groups both large and small, and hilarious fun for the whole family (sorry that all sounds like a generic advertisement on the back of the box), look no further than Apples to Apples. The gameplay is about as basic as it gets. There are two types of cards: green and red. Green cards have adjectives on them, like "ancient" or "weird" or "fragrant." 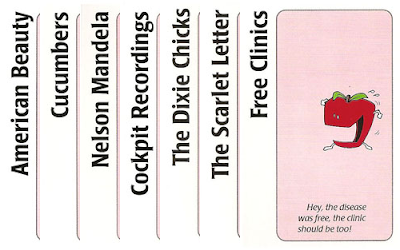 Red cards have nouns on them, including everything from famous people to just about anything else you can think of. As an added bonus are silly illustrations of anthropomorphic apples by John Kovalic (of Munchkin and Dork Tower fame), plus often-humorous "flavor text" that gives you a little more to read on each card. One player puts a green card face-up on the table, and the other players all give that player a red card with a noun that most appropriately (or inappropriately) matches that adjective. The recipient selects which card is the best or most entertaining fit, and the player who gave that red card gets to keep the green card for their collection. When one player has acquired a set amount of green cards, the game ends, and everyone gets to see what kinds of absurd adjectives they have accumulated to describe themselves. Apples to Apples can produce some pretty uproarious situations. Say, for example, the adjective on the table is "elegant," and the red cards in your hand include the likes of Adolf Hitler, Captain Kirk, Hellen Keller, Republicans, and Festering Wounds. Depending on who's judging your response, you may need to be careful about how you answer. Sometimes it doesn't matter, though; there's something inherently funny about elegant festering wounds, no matter how grossed out the recipient may be. Apples to Apples comes in several different flavors, and all the cards are interchangeable so that you can mix and match to your heart's content. There's a Bible Edition, a Disney Edition, a version specifically for kids (now with 100% less Adolf Hitler! ), and many more. Apples to Apples has all sorts of variant rules as well, so don't assume that the way I described is the only way to play. For all I know, my friends might have been making up the rules as they went, so I can't even guarantee we're talking about the same game right now. Apples to Apples is great for parties, family get-togethers, and squelching those "I've run out of things to do with my friends" blues. It's a great way to subtly get to know people better by watching how they play, and it's a guaranteed laugh riot.